Motus Innovations is empowering stroke sufferers to recover their independence. We are developing wearable robotics and gamified software which helps stroke sufferers to do more physiotherapy and recover more quickly. What’s more, we’ve built intelligence into our software platform that tracks and even predicts recovery, helping patients to optimize how they engage with their therapy. Worldwide, 17 million people have a stroke each year, of which three quarters result in upper limb disability. Daily physiotherapy significantly improves recovery and repetition of key movements causes the brain to rewire itself. However, with over-stretched health services in the UK, up to 80% of patients do not receive enough therapy to meet their needs. Existing rehabilitation technology often requires the presence of a clinician, is too large or heavy for the home, is expensive, and has limited functionality. For stroke survivors, Motus Innovations will provide lightweight, easy-to-use devices that support all key movements of the upper limb, whilst adapting to patients’ specific needs as they recover. We are fortunate and grateful to have been awarded some prize money since our initial idea development. That, along with some support from family and friends, meant that we could create and iterate upon our prototype device. Now that we have our hardware and software prototype and a clear business model – and understand our market and its needs – we are ready to accept funding, which will see us able to manufacture our first product and bring it to market, as well as complete R&D on our pipeline projects. What were you doing before you started Motus Innovations? Founder Ross Ward initially began studying medicine in London, before transferring into a medical engineering degree at Queen Mary University. He has also spent some time working in industrial engineering and IP law. He first had the idea for Motus after his grandmother had a stroke and was left disabled. Head of operations Paloma Torrado Vazquez also studied medical engineering at Queen Mary University, where she and Ward took classes together. Before Motus Innovations, she was working in healthcare data analytics, but she was passionate about using medical technology to improve patients’ lives – and so was excited to join the project. Stephanie Hodgson, Motus Innovations’ head of product, had worked for several years as a stroke physiotherapist in Australia and had previously founded a company that developed technology to improve financial inclusion in South-East Asia. 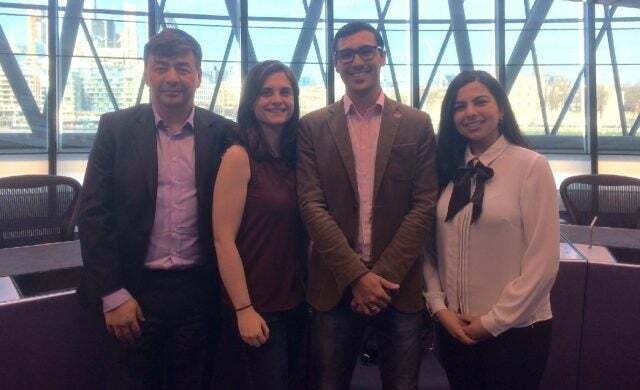 Ward and Vazquez discovered Hodgson at a networking event hosted by Imperial College London, where she was completing her Masters in international health management. It only took a 60-second pitch for Motus to catch her attention, and from the get-go it was clear that she was a perfect fit. In London, the start-up ecosystem is really supportive. There aren’t many places in the world that are better for bringing new ideas to life. We’ve also benefited from accelerators like MassChallenge UK and co-working spaces such as Camden Collective, as well as organisations that support student entrepreneurs, like NACUE. We have been able to meet loads of other start-ups and draw on their experience to help Motus Innovations succeed. To learn more about starting a business in London, view our free guide to the city here.